a book about healing, and I’m hoping that it can do as much healing and good as possible. To help with that, I’m going to donate author proceeds (my portion) to breast cancer organizations—so the more books I can sell, the more help the book can give. 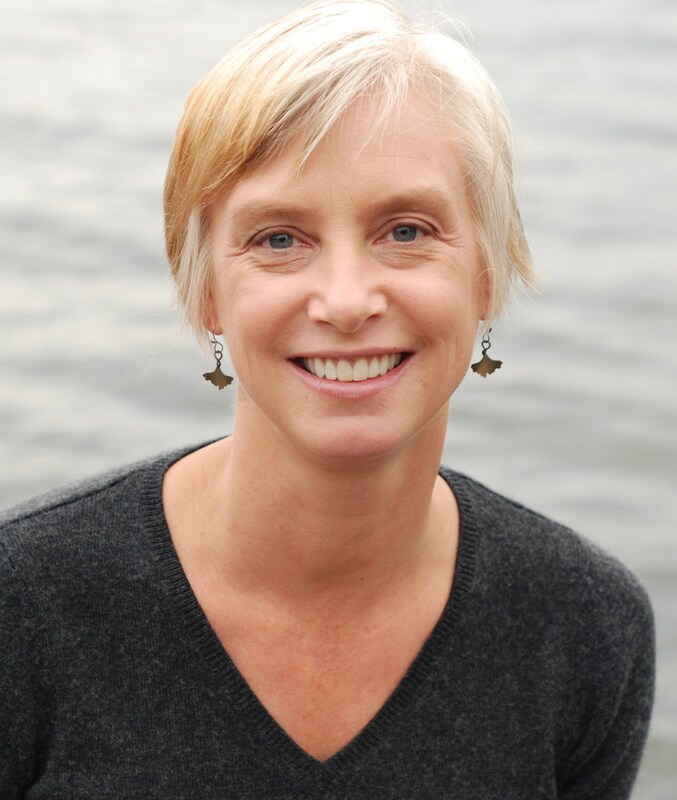 Joannie Stangeland is the author of two poetry chapbooks—A Steady Longing for Flight, which won the Floating Bridge Press chapbook award; and Weathered Steps from Rose Alley Press—and a winner of the Dallas Poets Community National Poetry Competition. Joannie was accepted into the Jack Straw Artist in Residence program, and she has taught classes at Richard Hugo House in Seattle. Currently she is the poetry editor for the online journal The Smoking Poet. My earliest inspirations were art and music—in the form of Mother Goose. I had—and still have—a thick volume edited by Marguerite de Angeli that included detailed line drawings and sumptuous color plates. I imagined the worlds in those rhymes and those pictures, and I wanted to go there. In the past, I’ve felt odd citing nursery rhymes as my first creative influence—but those rhymes offer music and concrete imagery. They’re visual and sensual and memorable—good patterns to have. Later, I was drawn to Joni Mitchell’s music—especially the images in her lyrics and the way she’d manipulate a line, draw it out, put the rhyme where I didn’t expect it—and it worked, and worked better. In college I found Rising Tides, an anthology of women’s poetry. That introduced me to a selection of poets, including Anne Sexton. The Furies—not only did I wish I’d written those poems, or my version of those poems, that I’d had the idea first, but they introduced me to the idea of poems in a series, which has become a near-constant pursuit for me. I’ve also found inspiration in poems by Frank O’Hara—and I revisit them when I feel like I’m playing it too safe, coloring strictly inside the lines. These days, the poet I return to most often is Lynda Hull, and I also keep close by the works of Cole Swenson, Roberta Spear, Louise Glück, and Oliver de la Paz. First and foremost, Nelson Bentley. I had to stay in college an extra three quarters (long story), and to offset all the physics and chemistry I was taking, I signed up for his poetry workshop. Previously, I’d had a fairly scathing poetry workshop experience with a visiting professor. Nelson’s class, and his welcoming generosity, gave me back my permission to write, to fail, to learn, and to try again. Years later, Nelson’s wife, Beth Bentley, introduced me to a new commitment to craft. (When I was in Nelson’s workshop, I thought of Beth’s class as “those really serious poets upstairs” and was intimidated by them.) Encouraged by a friend, I signed up for Beth’s workshop, only to find out that it was the last one she was going to teach. I was that lucky! I learned a lot that quarter and continued learning with a group of her students that met regularly. I’ve been fortunate to be a part of that group now since 1992. Judith Skillman, another member of that in that poetry group, has also been an important mentor to me and a touchstone as over the years we’ve sent our poems back and forth in the mail. I think my work stayed mostly the same for a long time—perhaps some strengthening, some sharpening of craft, and a greater comfort with sonnets and other forms. But my real adventure started about two years ago. First, I finally began to understand (in my way) prose poems, and I noodled around with them, trying to get into their surreal spirit. Then, I took a workshop from Sarah Vap and started to experiment with fragments. My fragments aren’t very broken up inside the line, but I’ve been exploring fragmentation of narrative sense—juxtaposition. My favorite analogy is Delacroix’s color theory—the idea that instead of blending the colors into one shade, you place two colors side by side and let the viewer’s eye and mind blend them. I’m placing sections side by side and hoping that in the space between them they create a new relationship. Later, after reading “Fog” by Mei Mei Berssenbrugge, I started to work with sequences by tightening the framework (introducing uniform line lengths and stress counts) and building the ideas from sequence to sequence. It’s been fun! First the opening, the breaking apart of the fragmented lyric and then the sequences’ cohesion. I’m still working in those forms and also trying to get back to some poems that I’d like to think of as simple and yet layered—present for the widest possible audience but also to be rich enough to come back to and read again. Ravenna Press is publishing my new book, Into the Rumored Spring, this autumn—and my first priority is to get it out into the world. The book is a collection of poems that I wrote for a friend, a book about healing, and I’m hoping that it can do as much healing and good as possible. To help with that, I’m going to donate author proceeds (my portion) to breast cancer organizations—so the more books I can sell, the more help the book can give. Then I have two more manuscripts—the fragments and the sequences—that are in the nearly ready stage, and I want to put the finishing touches on them (one at a time). And I’m collaborating with a friend who’s a photographer to create a book of poems and photographs that explore loss and grieving. Eventually, I’d like to spend more of my time writing. How? I haven’t figured that out yet. It might be after I retire from my day job. I think it’s hard to narrow the question to twenty years, or even to women (although I find that, without consciously deciding, I read mostly women poets). I’ll find some amazing poet and think the poems are experimental—revolutionary! Then I’ll find out that the work is 30 or even 40 years old. Yes, I get behind times, but I try not to let that stop me. I look wherever, whenever, and see who’s doing what interests me right now. To that end, I have a stack of books by Fanny Howe packed for my vacation—and I’m so excited to read them! Do you mean writers who are less known now? Younger writers? I realize I’m answering a question with a question—and it’s probably because I don’t have a better answer. To me, promising implies that more is coming—the poets who will keep writing, creating a body of work that readers can follow. I’m looking for poets who can teach me something, women who are pushing poetry’s boundaries in new ways—taking risks, but risks I can catch up with (eventually). Some of the poets I’ve been looking to and looking for recently—Susan Browne, Alexandra Teague, Tracy K. Smith—but it’s likely that everyone else has been reading their poems for years. I don’t want to miss the poems by Martha Silano, Lillias Bever, and Katrina Roberts. Now I’m sure I’m inadvertently omitting many others. The poet whose poems I want everyone to have a chance to read? Pat Hurshell. Her poems are phenomenal—detailed, precise, and yet vast, operatic. I hope she’ll have a book out soon. Also, you recently published an interview with Beth Myhr, and I’m really looking forward to her new book. I saw an early draft of the manuscript, and I’ve thought of that work often. I’m eager to have that book on my table, in my hands. Working, Playing Poet. I write as part of my day job. Occasionally, I attempt an essay. I keep a blog. But poetry is the center, and I remain committed to writing and learning poetry. 8.) The poems from your next book, Into the Rumored Spring, forthcoming in October, 2011 include poems that concertedly negotiate how the body admixed with our transient senses of self, live in a space of dark and light and love and how this is expressed in how we live. The poem, “More than the Sum,” reads, “If a part of herself is missing, / it is no longer a part of herself. / If she has a new body, / she has her own same self.” I am interested in how you see the body in relation to the sense of self. Our senses located in the body inform our sense of self and allow us to love and connect to a deeper spirituality beyond mind and body. How do you perceive the expression of self inside and outside of the trine of mind, body, and spirit? I’ve been obsessed by body and body image for most of my life—not always in a healthy way—so I’m not sure I can write from a different view point. Working within that context or limitation, I see our bodies as our vessels to the world and, through the senses, our conduits to the spiritual. But they are not the whole story. When we see someone, we see her body first—we experience a surface. What’s under the surface? The rest of her story. “More Than the Sum” specifically speaks to the sense of losing a part of your body, which changes you in the present but doesn’t tell the full story. You’re still the same person who grew up inside your body, with all your memories. I’ve been looking for a visual image of this, and I think of a first-day-of-kindergarten photograph. As an adult, you’ve grown older, you’ve changed, and now you’ve lost something, but you’re also still that girl in the picture and all the people in all the years since then. You’re still your valuable self. As for the entire trine—in this case, the body is the hand you’re dealt, the changes beyond your control. The mind is how you process change. And the spirit is perseverance, the desire to heal, the effort to heal, the will to change. 9.) Linearity of language suggests a fragility of our concept of time, memory, self and how our bodies interact in this eclectic dance. Your poem “Impossibility Multiplied,” seems to comment on these threaded ideas on several occasions including one line, “the sea won’t keep a story whole,” and later in the last, “draw your own hours in the dirt.” How in your opinion do we expose these fragilities in and outside of language? “Impossibly Multiplied” is one of the poems I refer to as fragments, so the fragility is a part of the form. The poem is also informed by Virginia Woolf’s novel To the Lighthouse, which to me invokes a truth through stream-of-consciousness. The shifts of observation and perspective offer a broken, and authentic, sense of experience. Speaking specifically to your question of language, I think that sentence fragments help (and I realize that the two examples you provide here are not fragments; they have verbs—and I love verbs and pursue them). And the disconnections, which reside both in the poem and are mirrored in the day—any day (even now I’m jumping up every few minutes to try to mollify the cat or keep him out of trouble, which creates a disjointed experience). The images connect but often by implication (or maybe they’re more obvious than I realize). 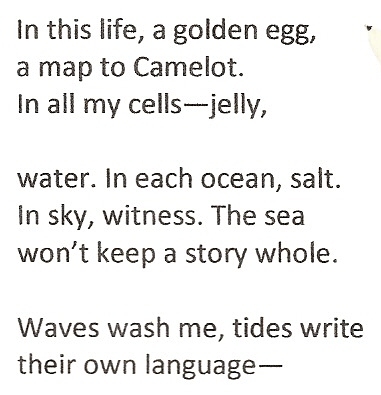 Really, I think that movement, like the sea’s constant movement, suggests the fragility, but I think it also brings a strength—a breadth of references for the conversation between the poem and the reader. Finally, I think that the poem’s silences provided by the short lines, short stanzas, and the dashes add to the fractured experience, which evokes the fragility while it gives the reader more opportunity to fill in the blanks, to interact with the poem. I am attracted to your conceptions surrounding the “love for wild things,” versus a notion of the “romantic” that is buried in a definition of love the poem seems to be confronting. Can you elaborate on this passage and further negotiate this broken open definition of love and how you belief this to affect your own life and work? I hadn’t thought of this passage as defining love—to me it suggests unintended consequences (quickly, be careful what you wish for). The first of the two stanzas does refer to fairytale love (think of Sleeping Beauty, with all those roses growing over the castle) and the idea that in the romantic, you just get the Prince or the Princess. You just get saved. It’s all the beauty without any of the work or risk. (While the princes did some work, Beauty slept through it). But in the prickly present, on the ground, those thorns are real and sharp. Here, I’m trying to acknowledge both the risk and the failure—how we can want something but let it slip through, until it overwhelms us. Yes, I wanted unbridled abundance—and yes, I love it, but now it’s completely out of hand and my own failure to do the work haunts me. This push-pull, carrot-stick, want-fear or want-regret conflict drives pretty much everything for me. It isn’t an easy way to get through the day—but in between those black and white extremes is the gray area that’s fertile for poetry.